Hello! Welcome to the Taylored Expressions March Release Day! All of the products that we have been peeking the last couple of days are now available in the TE store in the Fresh Out of the Oven Department! 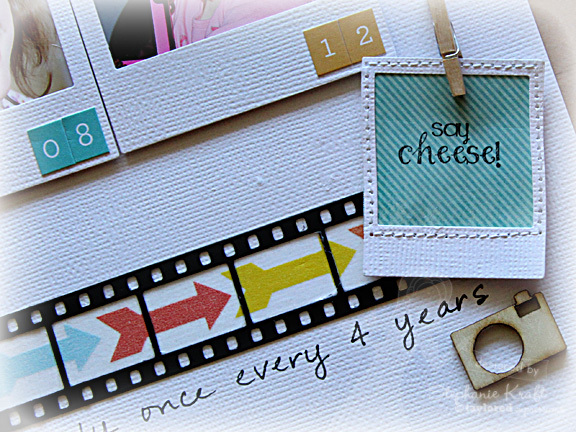 Today I am featuring the new Instant Photo Frames Dies! They come in 2 sizes and are perfect to frame an image or a photo. I've been wanting to make a Leap Day layout for some time, and they frames were perfect to showcase these photos of Sabrina's 3 leap years. Photos used (L to R): In '04 she was 9 mos old and her nose was orange from all the orange veggies she ate (sweet potatoes, squash and carrots). In '08 she was almost 5 and loved to ride in her Little Tykes car. And in the final photo, taken just last year, she was being silly posing with her iPad. Accessories: Taylored Dies: Instant Photo Frames, Film Strip Border, Flutter-Bys, Whimsy Alpha (Taylored Expressions); Pearls (Kaisercraft), Washi tape: arrows (My Mind’s Eye), photo taken (October Afternoon), Number stickers (Simple Stories), Wood veneer camera (Studio Calico), Mini clothespin, Foam tape, Thread, Sewing machine. This is adorable! I love seeing your layouts... they are always fabulous. Such a great idea to stitch over the letters, I love that! So clever, Steph, I love this! Your daughter is soooo lovely! 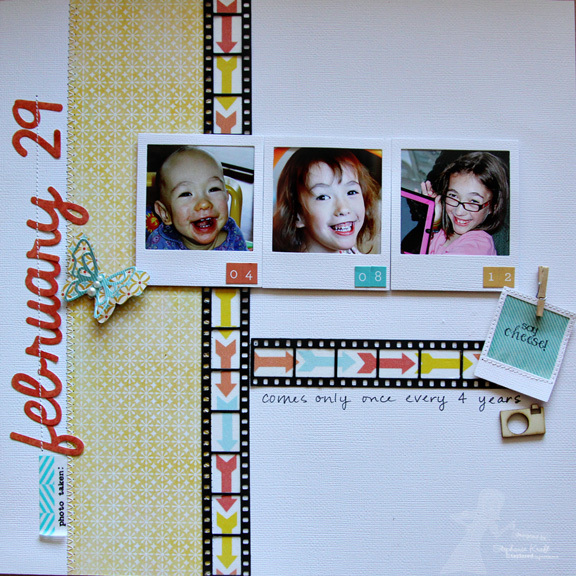 Great scrapbook page. 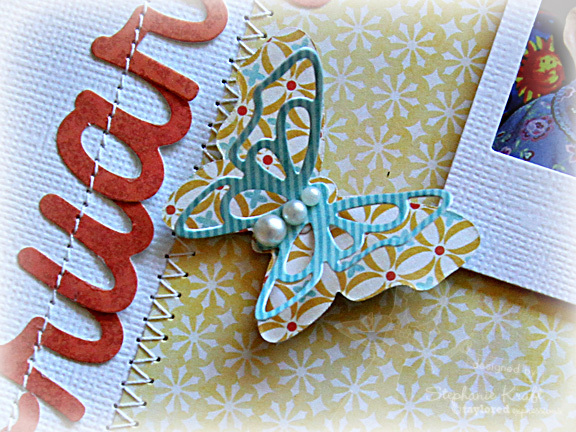 Love the images and how you used the stamps and dies. This is just adorable! Love all the stitching!